The Linksys Wireless Network Monitor is an application that allows you to check the status of the wireless connection, search for available wireless networks, connect to a wireless network, and create network profiles that has different wireless settings. This comes along the Setup CD, and only installs on Windows XP, 2000, and ME/98. For Windows 7 and Vista OS users, you may install the wireless driver and make use of the built in Windows wireless utility to scan wireless networks. To learn how to do this, click here. 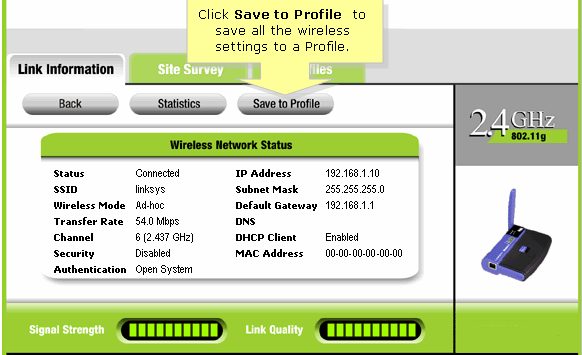 The wireless information can be found in the Linksys router's web-based setup page. To learn how to obtain these information, click here. NOTE: If you’re using a non-Linksys router, contact your router manufacturer for instructions. 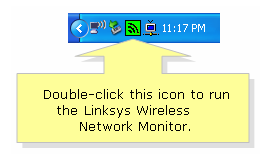 Double-click the Linksys Wireless Network Monitor icon at the bottom right corner of your screen to run the utility. NOTE: It is recommended to use one utility to manage the wireless connection at a time. If your computer uses Windows XP's Wireless Zero Configuration to connect to the wireless network, click here for instructions. 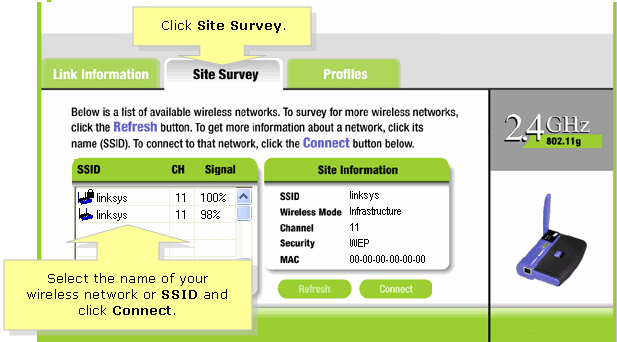 Click Site Survey and select the Wireless Network Name (SSID) of your network, then click Connect. NOTE: The following SSIDs on the list are the available wireless networks detected by the wireless adapter. To connect properly to the network, make sure you're picking up a good signal for better wireless connectivity. To learn how to resolve poor or no signal issues on a Linksys router, click here. The SSID may not be on the list if the SSID broadcast of the router is disabled. To learn how to connect to a wireless network with the SSID broadcast disabled, click here. If you have wireless security enabled on the router, the software will be asking for a Network key or Password/Passphrase. 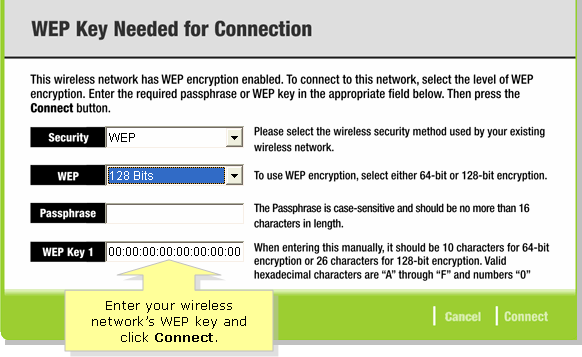 For WEP-enabled security, enter the WEP key in the WEP Key 1 field. 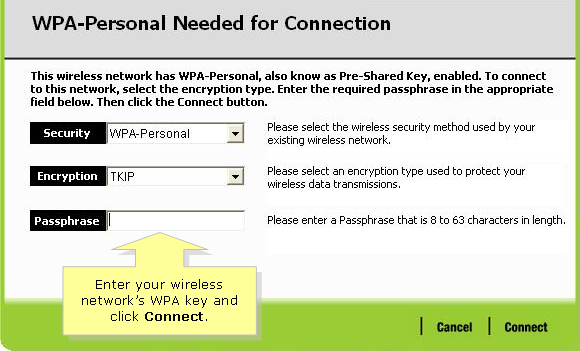 For WPA-enabled security, enter the WPA key in the Passphrase field. NOTE: Make sure to enter the correct password/key in order to successfully connect to the wireless network. 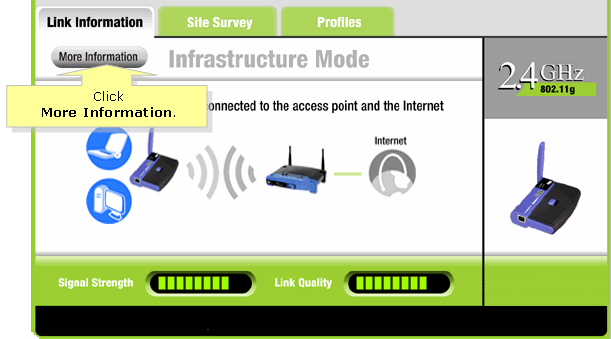 Once your wireless computer is connected to the network, you will be redirected to the Link Information screen. On the Link Information screen, click More Information. Click Save to Profile to save all your wireless settings. This allows you to be able to reconnect to your preferred wireless networks whenever the application is used. Once you have established a wireless connection you should now be able to access the Internet wirelessly. NOTE: If your computer is connected to the wireless network of your Linksys router, but your computer is unable to go online, click here.